Very exciting news out of Corktown this month: Ford has officially purchased the iconic Michigan Central Station Depot. 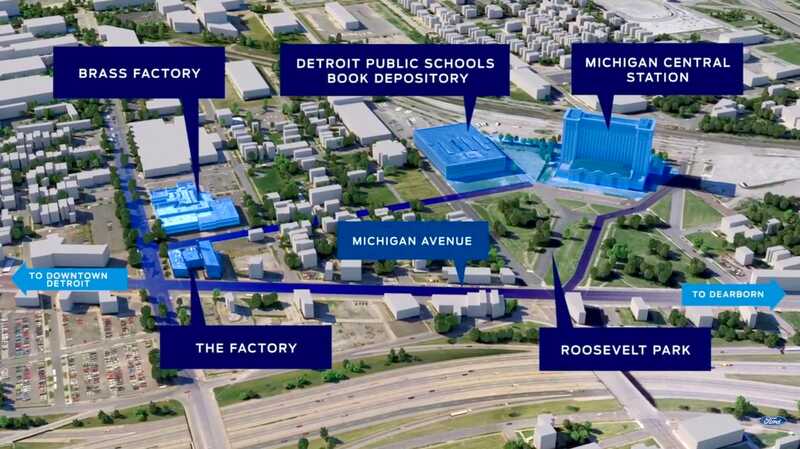 To celebrate, Ford held an open house over the weekend, inviting the public to check out the first floor and unveiling plans for the building’s future. For a long time since its closure in 1988, it sat neglected and unguarded, picked through and sold off piece by piece on the streets by scrappers and integrated into some of the more recently built homes nearby. People camped there, lived there, held photography classes, and watched the city fireworks from the roof, unbothered. As Detroit began to change and as Corktown experienced a resurgence in popularity around it, the train station remained stagnant – that is, except for trespassing arrests by both DPD and Border Patrol, because it was owned by the ultrawealthy Matty Moroun, who also privately owns the Ambassador Bridge. Still, it was known the world around for its architectural grandeur and abandonment, and people often continued taking the risk anyway. Over the past few years, small improvements such as the addition of security cameras, new windows, and lights on every floor began to slowly appear, but the sale of the property is very recent news, having just been announced within the past few weeks. For the open house this weekend, the first floor was cleaned up, certain rooms were roped off, and attendees were allowed to wander on a “self guided tour” through placards with descriptions and old photos. There were displays and projections set up throughout, and a slanted mirror was centered in the lobby to reflect the projections against the arches and windows. One of my favorite things that’s happened since the purchase of the train station was the return of the exterior clock. The person who had it in their possession (often called ‘the thief’ in the media) contacted the Henry Ford Museum, offering the employees a location in an abandoned building where the clock had been hidden for pickup, and thanking Ford for believing in the city of Detroit. Since then, an additional 20 people have come forward offering to return MCS artifacts ((update 7/4/18: Ford has opened an official Lost and Found for the building, seeking specific artifacts such as a large interior clock, light fixtures, and the filigree ticket window bars. If you happen to be among those “thieves” who have returned artifacts to Ford, I’d just like to say I think it’s pretty cool of you to have kept those pieces safe from the scrapyards for all these years)). The clock was on display for the open house, and I was really happy to have had the chance to see it. Also purchased were the Book Depository next door, a factory building on Michigan Ave, and the Lincoln Brassworks Factory. The brass factory was evacuated of its tenants in 2016 after some air quality issues, and may have to be demolished. Plans for MCS and the Book Depository include residential and commercial spaces. Ford hopes to have 2,500 employees working here by 2022. I’m so glad that they decided to extend the open house for an extra day today, as I was among the over 6,000 people waitlisted for the weekend tours! Great news and great photos! Great news, post and fotos! Lived in the Detroit area in 2011 and I was always amazed when driving pass this beautiful building.